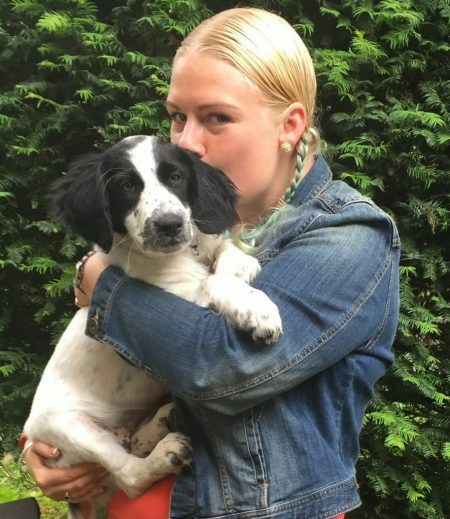 Carrie realised working in an office environment was no longer for her, she pursued her dream of working with animals and became a successful franchisee of a local dog walking & pet care company in Coventry in 2013. Whilst previously working for the pet care company, Carrie helped build up the business and covered a wide area of Coventry. She has a vast experience and knowledge of working with and owning animals from dogs and cats to guinea pigs and terrapins, so you can be rest assured your pets are in the best of hands. Carrie decided it was time to venture out by herself and to pursue her passion in training & behaviour and her love of taking care of dogs, cats and small animals. Carrie studied Dog Behaviour at International Animal Behaviour Training College where she passed all of her exams to a high level. She is a proud member of Pet Professional Guild (PPG) who’s force free code of ethics she fully promotes and adheres to. She recently became certified with Pro Dog Trainer, where she has added more tools to her tool box which will benefit her clients more. This year she decided to add another accreditation and is waiting on a date to become Accredited Dog Training Instructor with the Association of Pet Dog Trainers (APDT). Since beginning her studying, she knows how important it is to keep up to date and that you can always learn more. With this, she regularly attends seminars and training courses to update her knowledge, which is of paramount importance to her. She is passionate about helping people living happier lives with their dogs. Her aims are to promote responsible dog ownership, to help train dogs to be a well behaved member of the community and to help prevent behavioural issues by educating dog owners. She uses force free, modern, reward based motivational training with the foundations built on science and ethics. Whilst your pets are in her care, her mission is to ensure the well-being of your pets while you are away from them, and to do it with respect, attentiveness and loving care. She wants you to be comforted by the peace of mind that comes from knowing someone trustworthy, reliable and compassionate is looking after your pets who are most dear to you. In our own way, we take care of you, as well. To all our loyal clients, thank you for trusting us and allowing us to do something we all love every day.